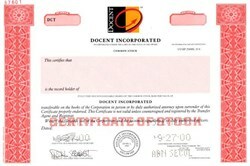 Beautifully engraved specimen certificate from the Docent Incorporated printed in 2000. This historic document was printed by the Security-Columbian United States Banknote Company and has an ornate border around it with a vignette of the Company's logo. This item has the printed signatures of the Company’s President and Chief Executive Officer, and Executive Vice President Secretary, and is over 16 years old. 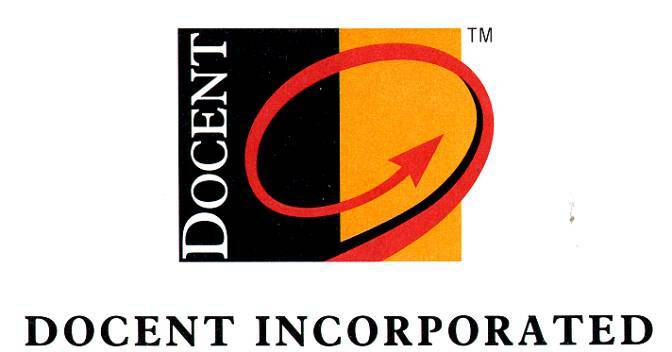 Docent Inc. (Nasdaq:DCNT) is a leading provider of integrated software solutions proven to directly drive business performance through learning. Docent solutions for sales performance, product launch, channel effectiveness, customer education, compliance, ERP/CRM system implementations, and other business priorities are enabled by the industry's most comprehensive suite of business performance management applications, industry-specific content, and world-class services. Solutions are tailored to address the unique requirements of vertical markets, including government, life sciences, energy, high tech, telecommunications, financial services, retail and manufacturing. Docent outperforms the industry in customer satisfaction benchmarks, delivering compelling and measurable ROI to blue chip customers such as Cingular Wireless, Harley-Davidson, Wachovia Corporation, Lucent Technologies, Kelly Services, Eaton Corporation, D&B, Halliburton, Rockwell Collins, and Bechtel Group, Inc. Docent partners with the world's most prominent systems integrators and business process outsourcing providers, including Accenture, Exult, IBM Human Capital Solutions, Cap Gemini Ernst & Young and Deloitte Consulting. Docent is distinguished as a leader by Gartner in the 2003 e-Learning Suites and LMS Magic Quadrants, and by the META Group in the 2003 METAspectrum report on learning management system vendors. Docent is headquartered in Mountain View, California, with other offices throughout the United States, Europe and Asia-Pacific.